Love Is The Highest Frequency. Everything is energy and a vibration that includes love. When you immerse your total being in love you vibrate at a higher frequency. These vibrations go out in the world. Now more than ever people who are striving for spirituality and those who are Lightworkers are being bombarded with negative energies to stop the Love vibration from going out into the world. Do not let the negative energy of forces and others stop you from sending out that light. If you can focus on minimum of five minutes a day on just the vibration of love you’ll start seeing changes in your own life. You can even chant the word love and feel that vibration go through you. Love really is all that matters. It is the one thing that changes the world and that transcends time and space. Love is all – Love is you. The Beatles wrote about love being everything. Enjoy this powerful song. Preparing for 2012 and Beyond! With all the changes occurring in the world you do not need to be a weatherman to know which way the wind blows. It is time to prepare your spirit to withstand these changes and to be strong to help those in need. Despite what many people believe about the Mayan prophecies predicting the end of the world on December 21, 2012 it is simply not true. In fact the Mayan calendar extends for thousands of years beyond. There are going to be a lot of changes occurring, but it will not be the end of the world. In today’s world justice is often very harsh, but as you find love within your spirit and acknowledge the Light that is carried by every soul, you will find yourself changing and becoming more compassionate and caring. It is the Light of the Divine that is removing the darkness that lowers your vibration. Each one of us is composed of vibrations and in the spirit world everything vibrates to the Divine Light. 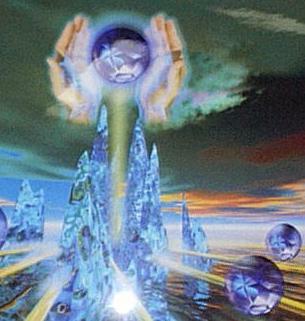 As you visualize more Light upon Earth you are helping to clear away the dark vibrations. The more you move into the Light of the Divine Spirit the less affect the negative vibrations can have upon you. No matter what happens you will find yourself feeling safe and secure when you are anchored by Gods White Light. By doing this the only time that you will have negative experiences is if there is a karmic reason. The Divine Light is your protection and this is why it is important to visualize this perfect White Light protecting your body, mind, and soul as many times as you can on a daily basis. Many of you are experiencing emotional and financial lows that keep you torn between spirituality and living in the material world. As long as you keep yourself in the White Light you will eventually rise to a higher level than when you started this earthly journey. You may begin to notice that others who have passed over are working in your life to help lift you up spiritually and physically. The spirit world has a great interest in each person’s evolution because it is important in regards to the future of your universe. Remember love and light does permeate the darkness. Focus your energies on keeping the Divine Light flowing in and around you and see your world change. As a psychic medium it is my job to see the future and give you notices of what is coming. Follow what I have written and your spiritual self will be well prepared for the future. I have also written about being prepared for any and all emergencies with supplies. We need this for our physical selves as the earth changes; you can read about this at this link: Are Your Emergency Supplies Ready? Open the gate to 2012 and let the new world of joy, peace and love begin with you. With all the changes occurring in the world you don’t need to be a weatherman to know which way the wind blows. It’s time to prepare your spirit to withstand these changes and to be strong to help those in need. Despite what many people believe about the Mayan prophecies predicting the end of the world on December 21, 2012 it is simply not true. In fact the Mayan calendar extends for thousands of years beyond. There are going to be a lot of changes occurring, but it will not be the end of the world. In today’s world justice is often very harsh, but as you find love within your spirit and acknowledge the Light that is carried by every soul, you will find yourself changing and becoming more compassionate and caring. It is the Light of the Divine that is removing the darkness that lowers your vibration. Each one of us is composed of vibrations and in the spirit world everything vibrates to the Divine Light. As you visualize more Light upon Earth you are helping to clear away the dark vibrations. The more you move into the Light of the Divine Spirit the less affect the negative vibrations can have upon you. No matter what happens you will find yourself feeling safe and secure when you are anchored by God’s White Light. By doing this the only time that you will have negative experiences is if there is a karmic reason. The Divine Light is your protection and this is why it’s important to visualize this perfect White Light protecting your body, mind, and soul as many times as you can on a daily basis. The best moments you have ever known are still with you. All the happiness and joy you have ever experienced is a part of you. Indeed, it lives in you. Circumstances most certainly change, from moment to moment, but the good things which you’ve known never go away. Deep down inside, you are still the same person you were on the happiest day you’ve ever experienced. And deep down inside is where things truly matter. Joy is cumulative and persistent. Think of a happy time and you are happy. The world will often attempt to drag you down and when it does, summon the power of your happiness. Think of the best moments you have ever known. They are still with you. And there are many more to come. Joy is more than the pleasure of the moment. It is an affirmation that life is very much worth living. It may sometimes get covered up, but it never has to go away. Keep it with you and add to it all that you can. Be sure to scatter joy to those you meet so that this vibration continues to grow. Los mejores momentos que has conocido todavia estan con usted. Toda la felicidad y la alegria que has experimentado es una parte de ti. De hecho, vive en ti. Las circunstancias sin duda cambian, de momento a momento, pero las cosas buenas que has conocido nunca desaparecen. En el fondo, sigues siendo la misma persona que eras el día mas feliz que experimentaste. Y en el fondo es donde las cosas son verdaderamente importantes. La alegría es acumulativa y persistente. Piensa en un momento feliz y seras feliz. El mundo a menudo intenta arrastrarte abajo y cuando esto sucede, debes convocar a la potencia de tu felicidad. Piensa en los mejores momentos que has conocido. Ellos todavía están contigo. Y hay muchos mas por venir.